In stock -This product will ship today if ordered within the next 6 hours and 8 minutes. This extra gentle feminine wash, enriched with organic aloe vera and essential oils, is designed to cleanse and refresh even the most sensitive skin. Aqua, Betaine*, Caprylyl/capryl glucoside*, Glycerin*, Sodium cocoamphoacetate*, Xanthan gum*, Aloe barbadensis leaf juice**, Aniba rosaeodora wood oil*, Pelargonium graveolens oil*, Citrus aurantium bergamia fruit oil*, Rosa centifolia flower extract*, Vanilla planifolia fruit extract*, Viola odorata extract*, Citric acid*, Parfum*, Geraniol°, Citronellol°, Linalool°. 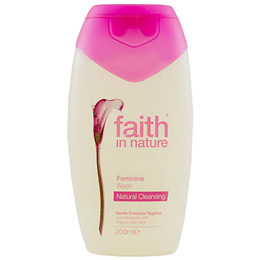 Use this very mild feminine wash as part of your daily cleansing routine. Wash and rinse through with water. For external use only, avoiding the eyes. Below are reviews of Faith in Nature Feminine Wash - 200ml by bodykind customers. If you have tried this product we'd love to hear what you think so please leave a review.